We thought they looked pretty good for a start and we ended up going ahead and getting this one printed, which we used for one of our first tutorials (Sugar Horses and Carriage Centrepiece). After using it for the Cute Farm Animals Cake tutorial, we decided to use it again for the Unicorn Cake tutorial which seemed appropriate as well. This large print worked out pretty good however, it took up a little too much time trying to find a high resolution image that was suitable, purchase it to avoid any copyright issues and have it printed which also ended up being quite expensive. On top of that, it would need to be done well in advance of each tutorial so we wouldn’t be able to have as much freedom when it came to spontaneous “Lets shoot a tutorial on this!” sessions. An ideal solution because it gives us the freedom to put anything we want in the background. We were aware that this could be a little tacky but we felt that provided we don’t over do it and take too much attention from the ‘learning’ aspect of the tutorials, our tutorials would always look different (from the front camera) and be that little bit more interesting. We thought it would be another way that we could be creative with what we are doing. So we gave it a shot for the first time with the 3D Swordfish Cake tutorial. It’s not perfect by any means but we thought it turned out ok for a first try. There were a couple of mistakes that we made but fortunately they weren’t deal breakers. Firstly, the lighting on the green backdrop wasn’t flat enough and it actually had a gradient being lighter at the top, to darker on the bottom. This made it difficult for the video editing software to clear out the green without effecting other parts of the scene. It caused a big problem during video editing but I managed to work out some ways to compensate. 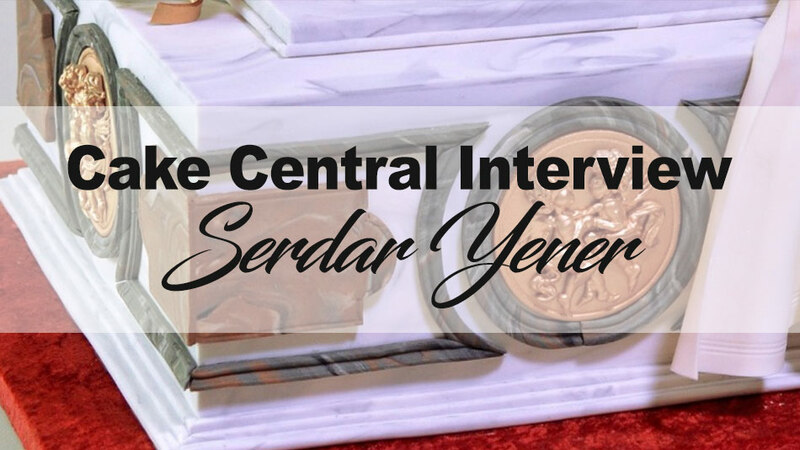 Secondly, the camera we used at the front is not the best one that we have so it made it a little harder to get a nice clean edge between Serdar and the background. 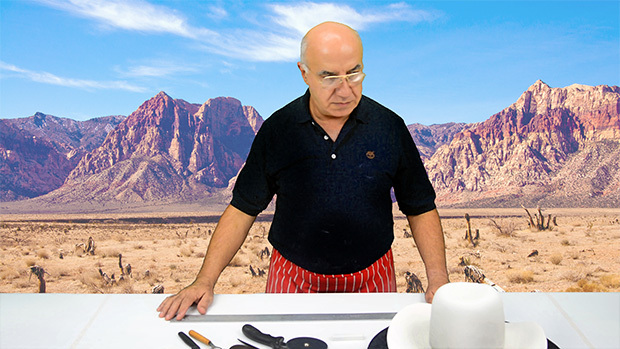 Our 3D Cowboy Hat tutorial that will be released next month (currently being edited) is our second try at the green screen and it will be a huge improvement from the first one because we fixed the two mistakes mentioned above. We’ll see how it turns out when its complete. 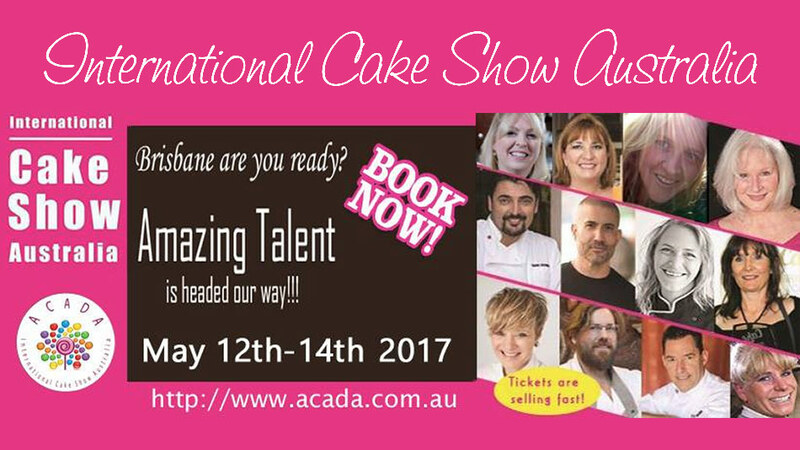 So why are we sharing all this technical information and how does all this relate to all you cake decorators out there? Well, we believe transparency is very important and we want our members to be able to contribute and help us improve so ultimately we can make better tutorials for you. So what better way than to share the stuff that happens behind the scenes. After all, we are making these tutorials for our members, so any feedback we get is very important to us. So what do you think? Do you like the green screen idea? Feel free to share your thoughts in the comments section below. I think the green screens are clever, well done, and they make every tutorial extra special. I really like the idea of the green screen mainly for the reasons you stated. 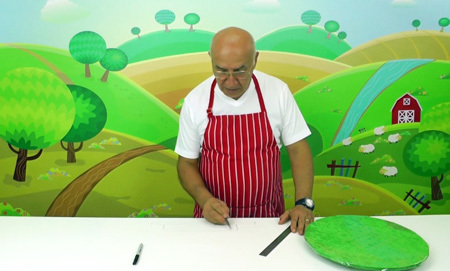 I like that if he is doing a kids cake the background will reflect that etc. Personally, I am not as focused on that as much as I am on what he is saying. I wondered, for the guitar cake if he owned all those guitars in the background! I think the green screen is an excellent idea. The same way that if I was I an actual classroom setting I wouldn’t need to see items in relation to the topic at hand but I am able to zone out all of the background “noise” and focus on what is being spoken by the instructor. I am enjoying all of the tutorials and am very thankful for the free ones because that is how I ended up purchasing tutorials as well. Thank-you. Love them! 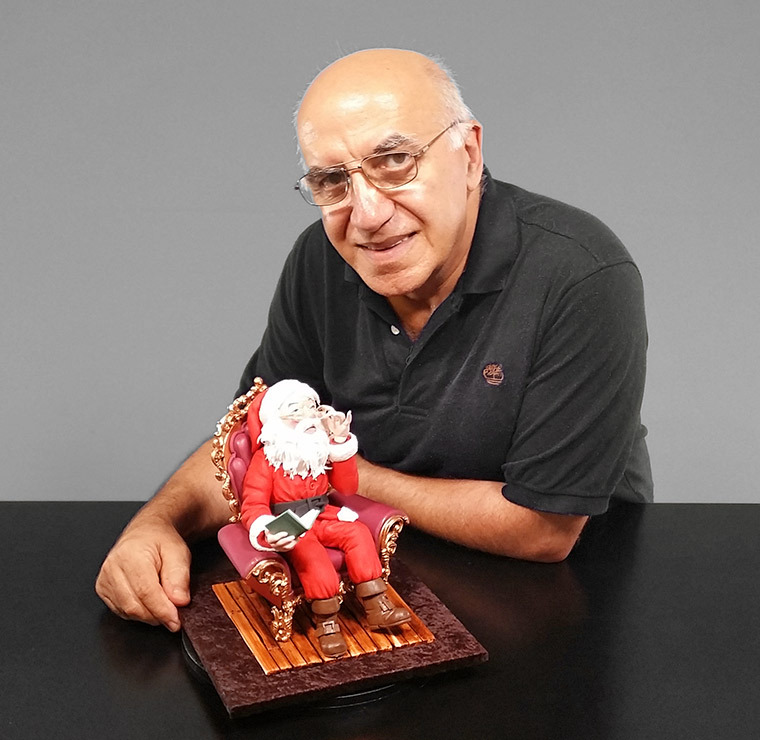 Keep innovating and showing us new and exciting ways to do things, the Yener’s Way! I like the background. 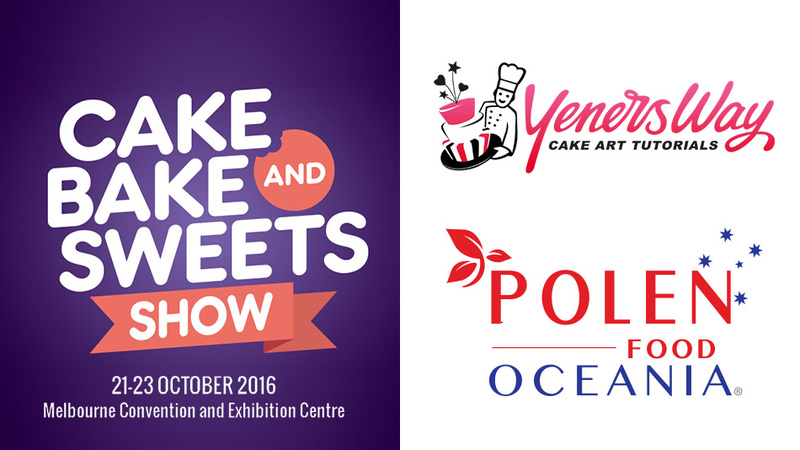 It puts you in the mood for the cake Yener is creating. Keep up the great work. Hope you don’t mind me saying that I find the screen really distracting and not relevant to what we are learning. An attractive, friendly studio or school kitchen setting perhaps displaying completed projects and other cake baking and decorating tools would be more appropriate. 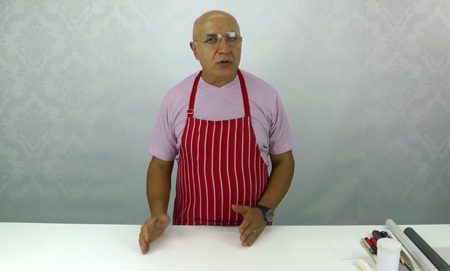 Muted background colours would put more focus on Chef Yener and the lessons in hand. The screen reminds me of children’s TV making Chef Yener look out of place! Ooooo dear I will feel terrible if you take this as a negative! No no not at all taken negative! Thanks for being honest giving us feedback. What you have mentioned is something we are completely aware of and we will do our very best to do it in a non distractive and tasteful way. I think we should wait and see a few more tutorials done in this fashion before making a complete judgement on it. You may be absolutely right. All that said, the greenscreen is more about having the complete freedom to choose any background we want and not about what the background is particularly of. 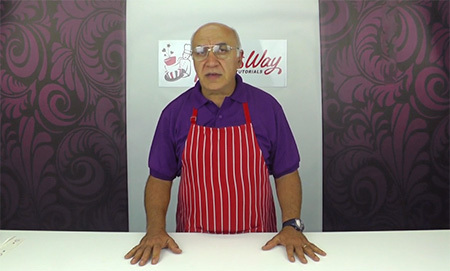 For example, with a greenscreen, we can still put Yener in a kitchen with cake decorating tools and completed cakes. Your comment and honesty is very appreciated.